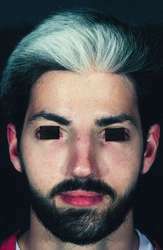 a hereditary disorder, transmitted as an autosomal dominant trait, characterized by wide bridge of the nose due to lateral displacement of the inner canthi and puncta; pigmentary disturbances, including white forelock, heterochromia iridis, white eyelashes, and leukoderma; and sometimes cochlear hearing loss. 1 an autosomal-dominant disorder characterized by wide bridge of the nose resulting from lateral displacement of the inner canthi and puncta, pigmentary disturbances, including white forelock, heterochromia iridis, white eyelashes, leukoderma, and sometimes cochlear deafness. 2 an autosomal-dominant disorder characterized by acrocephaly, orbital and facial deformities, and brachydactyly with mild soft tissue syndactyly. Cleft palate, congenital glaucoma, cardiac malformation, and contractures of the elbows and knees may also be present. Also called acrocephalosyndactyly, Klein-Waardenburg syndrome. a hereditary disorder of humans characterized by pigmentary disturbances, including white forelock, heterochromia iridis, white eyelashes, leukoderma and sometimes cochlear deafness. Blue-eyed, white cats with congenital deafness are considered similar to this syndrome. See also cochleosaccular degeneration. 4,16] Liu reported that the penetrance of low-frequency hearing loss in Waardenburg's syndrome was 14%. The routine use of DPOAEs in children with Waardenburg's syndrome can detect high-frequency hearing loss, and thus it can prevent overamplification in the lower frequencies during the fitting of a hearing aid, which is the primary therapy for patients with this syndrome. Really, nobody knows what the pathology is in the inner ear of Waardenburg's syndrome," Steel says. He says he knows of one marriage between two individuals with Waardenburg's syndrome, and their children have severe optic defects and pigmentary problems, including extremely fair skin.